Tony Hillerman has created another great read for all fans who love his fiction and nonfiction writing. 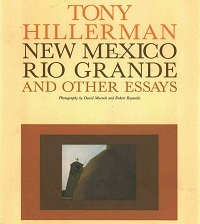 New Mexico, Rio Grande, and Other Essays contains some of Hillerman's best nonfiction work. Readers from around the world continued to request the 1974 book, New Mexico, he and photographer David Muench created. This successful, large-format title sold more than sixty-five thousand copies before it went out of print. Here, then, is that popular text along with Rio Grande, a lesser known, but equally compellling large-format book he did with photographer Robert Reynolds in 1975. Both essays are full of feeling, the first about Hillerman's state, "The Land of Enchantment," and the second about one of the great rivers of the Southwest which runs near his home in Albuquerque. Hillerman recommended including two other nonfiction essays that were frequently requested and not available in book form. "A Canyon, an Egret, and a Book: is a delightful description of how Hillerman sees his fictional characters in the real landscapes and places of the American Southwest. This essay tells about one place in Arizona that inspired several scenes in his award-winning novels. And a second piece, "Places for Spirits, Places for Ghosts," is also included. Complementing each of Hillerman's essays are related porfolios of new images by photographers David Muench and Robert Reynolds. New Mexico, Rio Grande, and Other Essays gives the reader a deeper appreciation of how Tony Hillerman sees the land he loves, as well as the places from which he draws his inspiration, and his intimate knowledge of the backgrounds upon which he casts the characters of his mysteries.